Format  Specify a format string to control how this measure is displayed. See “Specifying a Format String,” earlier in this book. Mathematical operators. Business Intelligence supports the standard mathematical operators: + (addition), - (subtraction), / (division), and * (multiplication). It also supports the standard unary operators: + (positive) and - (negative). MDX functions that return numeric values. 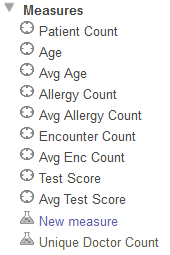 Many MDX functions return numeric values, including AVG, MAX, COUNT, and others. 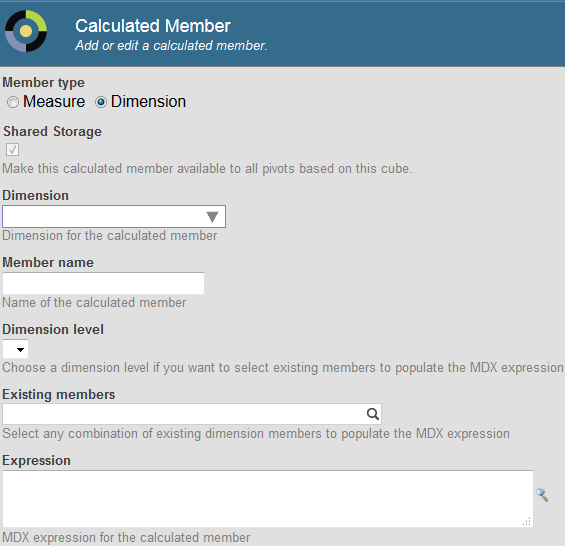 See the InterSystems MDX Reference for details. For other variations and specific recipes, see “Defining Calculated Members” in Defining Models for InterSystems Business Intelligence. The system then creates an MDX set expression in the Expression field. Format  Specify a format string to control how numeric values are displayed for this member. See “Specifying a Format String,” earlier in this book. Solve Order  Select a number to specify the relative order in which to evaluate this calculated member, compared to other calculated members that affect the same cell. See “Solve Order,” earlier in this chapter.